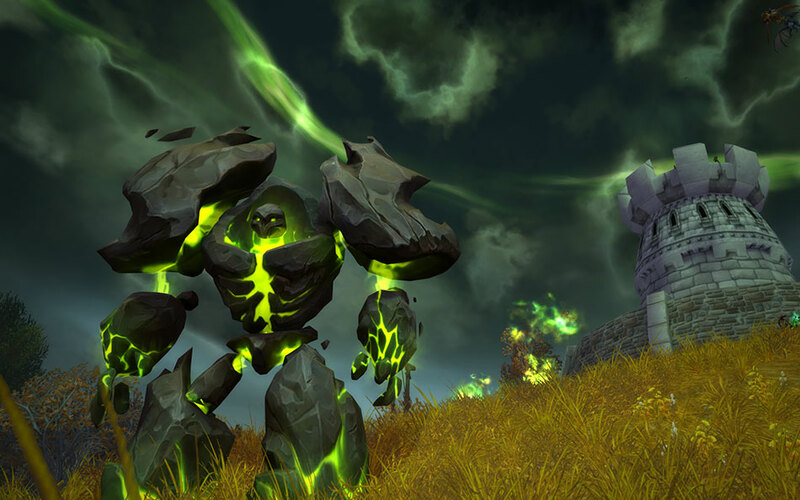 Matt talks WoW's Legion expansion with technical game designer Chadd Nervig and character artist Genevieve St-Michel. Q: Can you both please briefly talk about your roles in the upcoming expansion? Given its focus, I imagine you were both pretty busy! Gen: I worked as a character artist for Legion, and I primarily focused on working on visuals for armour sets and weapons. Then I did a little behind-the-scenes work to make a bunch of little visual things happen – things like getting quivers to show up with the hunter artifact, little things like that. Chadd: I'm a class and systems designer on WoW. I focus on the classes what specialisations there are – what abilities and talents they have, that sort of thing – as well as being a hub for all the other game teams and systems to figure out how they interact as one whole. Q: How early does work begin on a new expansion, and does direction trickle down from on high, or is there a pitch process of sorts? Chadd: We are looking forward for what ideas we are gonna work on next fairly far into the future. We're at least thinking about things several years ahead of time. Many of our lead designers are collectively working on what our next project will be at any time just so things are ready for us all to smoothly transition into as we complete projects. The majority of the team has probably been working on Legion for two years now, give or take. Gen: Yeah, I think all the disciplines are kinda staggered on when they start on things. I work in art, and I know we start a little bit later, once we have things settled in to what we want to be doing. Chadd: One of the best improvements as a team I'd say over the past several years has been our process work flow optimisation to make sure that everyone is able to keep working and not waiting on anyone. So it does end up being a lot of staggered work. Q: Gen, I understand you helped prototype a new technology that pushed player character appearance in new ways. Can you tell me about that? Gen: We worked on this whole system that allows us to put 3D models anywhere attached to the character, and this was used to get the demon hunter's horns to show up. If you look at the newest tier (19), you'll see that they have little bits and pieces here and there, like the mage has some scrolls on their hips, the priest has cool little pieces of paper hanging from his sleeves. It just really helped give it a nice little visual distinct look, compared to what we've done in the past. Q: Chadd, how did you approach the combat overhaul for Legion? What was the goal and how did you go about achieving it? Chadd: The main goal there was we were unsatisfied with how distinct our classes and specialisations were, and how they delivered on the fantasy that they promised. They had just been bloated over the years and muddled. So we did a lot of work to improve that fantasy and that distinction, especially making different specialisations distinct. So an assassination rogue feels different from a subtlety rogue, etc. But also on the class side, giving different classes more feel that feels uniquely their own. Much of that involved the abilities, but it also included things like animations as well. Especially on melee classes, giving their melee attacks unique class-specific animations so they feel different as well. Q: Gen, how does creativity work in your department? How do you go about creating interesting new assets for a game that's been around as long as – and is as expansive as – WoW? Gen: I don't think we've ever really created the same thing from start to finish with the same process. But we have a similar mindset: we wanna stay true to the feel of the game, and the look, and just the basic inspiration, so we wanna preserve that. But we do wanna keep pushing forward and bringing new looks in at all times, and just pushing the envelope of the cool factor of everything. We look at the world around us a lot. I feel like all the different races, we can see that they pull from different cultures from our world. It really helps ground things and makes them feel more real and tangible in how they interact together. Like I think the tauren pulls a lot from Native American look, with the totem poles and this and that. The real world makes it feel more real. Q: Chadd, similar question! How do you go about creating interesting new talent and abilities for a game that's been around as long as WoW? Chadd: Yeah that can be a challenge at times. We're always brainstorming different ideas for how we can create interesting gameplay, and a lot of it is fantasy-directed. In this case we're working on a new class, demon hunters, so we come in with abilities that deliver that fantasy and really show off that agile evasive nature of demon hunters that we're trying to sell. Anytime we can come up with ideas for little gameplay hooks or fantasy hooks… sometimes they're not right for what we're looking for, so we'll put that in our back pocket to use elsewhere, because anything unique is treasure. 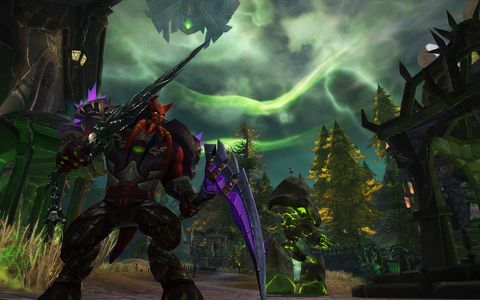 Q: Given WoW has been down the fel-themed bad guys route before, what challenges did you have ensuring that Legion felt fresh and yet still connected to the demons of WoW gone by? Gen: It's really a continuation of that same story. It was never wrapped, so we just kept embarking in it and going deeper and seeing where it takes us. We've definitely put a new fresh take on it with the art itself, and the story has progressed further, and there's more occurring in the world around it. Chadd: I think another add-on for that is: another great way we can make that fel theme stay fresh is by seeing how it mixes with other themes. 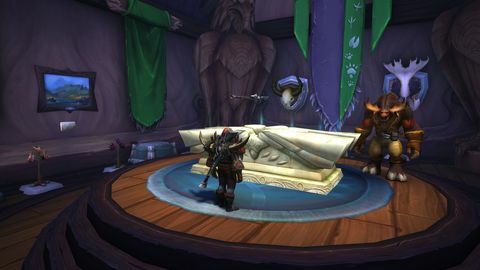 The Broken Isles is full of a variety of different cultures, and seeing the different ways they react to the Legion and Gul'dan from the night elves that live there to the high mountain tauren to the vrykul, they all have different ways that they interact with the Legion, and it gives a lot of freshness to it. Q: Chadd, are there any lines you cannot cross when designing new systems? That is, is there something you'd like to do, but it would run too great a risk of no longer feeling like WoW? 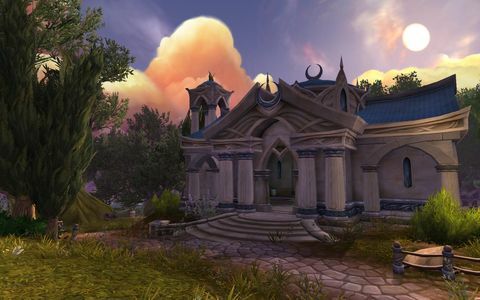 Chadd: There certainly are lines of what makes our gameplay feel like WoW's gameplay that we definitely try to preserve. But I think we're pretty free-form about being able to adapt different ideas into our game engine and our storyline. So, yes there are lines. If we made a class that was all skill shots that probably wouldn't feel very WoW-like so we'd have to do additional work to make that line up right, but that's something we could do I think. Pretty much the sky's the limit when it comes to coming up with ideas for us. Q: Gen, what was your brief for the demon hunter, and how did your department contribute to the feel of that class? Gen: Demon hunters have been in the lore for such a long time, what with Illidan being such a prominent character, so we already had a lot of story to go off of. 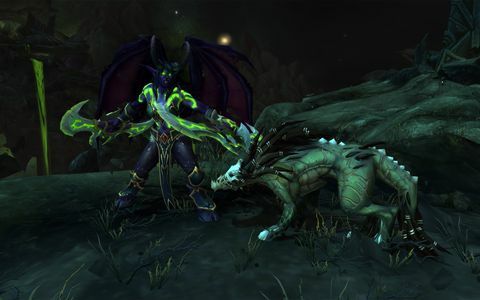 When it came to visuals we really just had Illidan and a few NPCs scattered around that were demon hunters so we started with that. We were seeing the art and other supporting media that's out there and just built up from there. Other art disciplines like prop teams had already started building things, and we just grew together and kept bouncing ideas back and forth until we figured it out. Q: Speaking of Mister Stormrage, did you have much flexibility with redesigning his character at all? Gen: With any character redesign it's a very tricky thing. Generally you just try to hold true to the feeling and the original artist's intent, and we try to add higher fidelity and pull it into a whole new look by just improving everything. So it's a balancing act between trying to not add to much and change it, while still improving the overall look. Q: Anything else you'd like to touch on that we haven't mentioned? Chadd: We haven't mentioned artifacts at all here, and artifacts are another major piece of Legion. 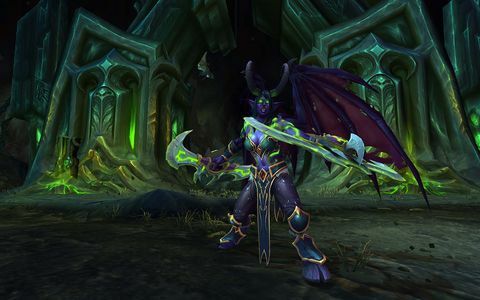 Pretty excited about that – it gets very powerful weapons in the hands of players and provides a progression path for them throughout the expansion, and they build a bond as you level up and explore the broken isles. Q: One is a fishing artifact – is that right? Chadd: There may or may not be a fishing artifact, I can neither confirm nor deny that! Gen: I'm particularly excited about the scaling zones as a feature of this expansion coming out. Just the ability that all the zones, you can start them in any order, and your friends can hop in being any level from 100 to 110 with you and you enjoy the content together. You don't have to worry about catching up to your friends or waiting for them to get to you. That's just a really fun way to hop in and play with everyone.